Last night I participated in The Lydia Project's 6th Annual Dessert Auction and Cake Design Contest. All proceeds go to help women with cancer. This event was an absolute blast. I donated Cake Balls and Cake Pops decorated purple for their colors. I also entered a cake in the contest. The cake was my pound cake with raspberry butter cream filling and marshmallow fondant. The cake features a hat box with the Lydia purse decorated with items needed by the foundation such as stamps, note cards, pens, lotion, and stamps. Thank you for participating in The Lydia Project's Dessert Auction. It as so great to see you and all your wonderful sweet treats. We did have a great time, in support of women coping with cancer. 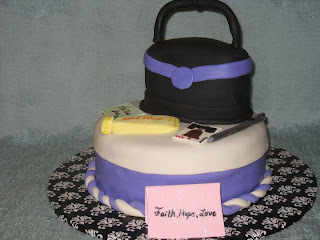 Your contest cake was AMAZING! Thanks again for your support!